I have an irrational fear of being in weddings. 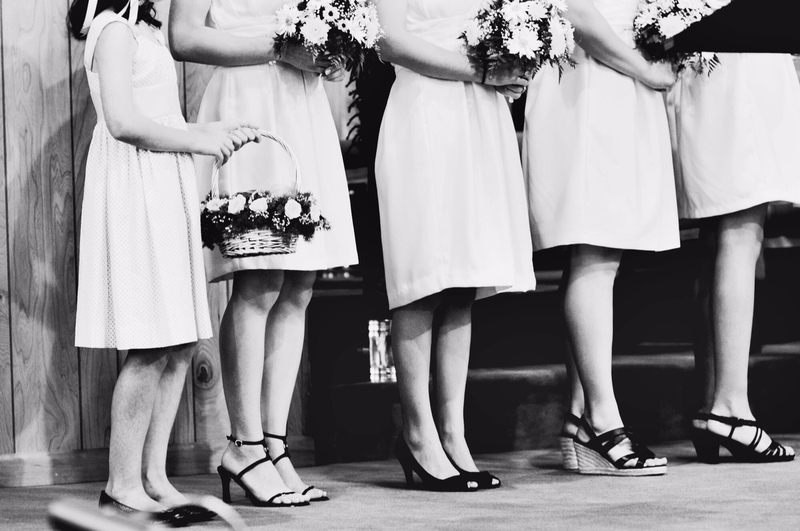 I fainted during a ceremony a few years ago when I was a bridesmaid and ever since, the thought of being a bridesmaid brings back that blurry vision, wobbly knee feeling. It’s irrational, I know. The reason I fainted in the wedding a few years back was because the wedding took place outdoors, in the Texas heat, and the ceremony was long, and, it turned out, I was sick. The perfect storm for a fainting bridesmaid. This past weekend I was a bridesmaid in another wedding. It was in Portland. It was indoors in an air-conditioned church. I was not sick. Yet, I was terrified I would faint again. All day I saw visions of myself falling to my knees in front of everybody, ruining the vows. I saw myself being carried away by groomsmen, unable to fulfill my bridesmaid duties, and forced to lie on a couch in the back (this is what happened last time). To add to my fear, the bride had asked me to sing during the wedding. Singing in front of people typically would not be a huge deal for me, but singing as a bridesmaid? This was concerning. During my rehearsal, the pianist warned me, as if she knew my history, “Don’t faint. Singers faint.” So do bridesmaids, I thought. I walked back to the bridal room feeling queasy. My friend, the bride, asked if I was ok. I told her I was fine. What bride needs to worry about her fainting-inclined bridesmaids on her wedding day? We circled up to pray. When we were done, I felt like I should ask someone to pray for me. To pray that I wouldn’t faint, but I didn’t. That would be stupid, I told myself. No one needs to know I’m afraid right now. No one needs to know about my little, irrational fear. Best to keep quiet. So I said nothing. I sat in the corner and sipped water and tried to have positive thoughts. The hour turned to minutes. The minutes turned to seconds and suddenly, I was walking down the carpeted aisle in three-inch heals, a pink dress and a fake smile. As soon as I stepped on stage, my heart began to race. My legs began to shake. The room felt hot and stuffy, and my little irrational fear felt huge. I was feeling faint. I needed help. I hate asking for help. I hate asking for prayer. I hate asking for rides to the airport. I hate asking for help when I move. I hate asking for anything in general, and if I am 5% capable of doing it on my own, I will. But I learned a hard lesson this weekend as I stood trembling at the front of the church. My fear had overcome me, and I was not going to make it through this ceremony alone. So in desperation, I asked for help. I scooted to the bridesmaid closest to me, who happened to be a nurse practitioner, and I told her I didn’t feel good, and I held onto her arm. I held onto her arm. In that moment, I needed someone to literally hold me. I was not going to make it by myself because making it by myself would mean literally falling on my face. No, I was not going to be Independent Andrea today. I was going to be needy and fearful and desperate Andrea. The Andrea I know all too well but rarely reveal to others. Though I had only met this bridesmaid the night before at the rehearsal dinner, she let me hold onto her. She told me it would be ok. She reminded me to breath. She didn’t shove me away or gawk. She was understanding of my little, irrational fear and she talked me through the ceremony. And guess what. I didn’t faint. Not when I sang the song. Not during the sermon. Not during the vows. I made it, standing the entire time, and it’s because I had an arm to hold onto. It’s because a nearly complete stranger was understanding and kind and gracious. I made it because I admitted I couldn’t make it, and I asked for help. If you’re like me—fiercely independent and ashamed of your secret neediness—I hope this story encourages you. I think if we independent types reached out to others more often and confessed our own inadequecies, we would find what I found in that bridesmaid: a gracious, kind and understanding response. We would find that our weakness brings out the strength in others and that fear cannot often be conquered alone, but it can be conquered with a little help. This reminds me of a sermon from a friend of mine. A few years ago, I was feeling very alone knowing I needed someone to lean on, but being too proud to ask. That sermon, “The Knot at the End of your Rope” helped me understand that we are not meant to do things alone. Not only is it okay to ask for help it is also okay to offer help. Wonderful words, Andrea. Thank you for reminding me that it is not weak to say, “I need some help”. In fact, sometimes that simple admission is a very strong thing to do. I love that you shared this, Andrea! Such an eloquent, honest expression of the fears inside so many of us. Thanks for the encouragement! Beautiful–the writing and the writer! It was such a blessing to meet you! Wonderful post and a great reminder! Thank you! Muchas veces tengo estas sensaciones acerca de hacer ciertas cosas y aún más con público presente es parte de mis interrogantes personales. Hace poco tenia una lección y dominaba el tema de maravilla pero cuando me pusieron frente a todos era como no sabia ni el tema que tenia que exponer, y así en diversas ocasiones, en lo emocional también me sucede expresarlos sentimientos que difícil situación, pero lo importante es superarlos y llevarlo al nivel de enfrentarlos y al final las cosas no son tan malas. Ser independiente es importante pero siempre recordemos que somos parte de un conjunto de personas y la individualizar nos limita en ciertos logros. Thank you for your honesty, I am a stubborn independent person, and it’s amazing how when looking at others, I can clearly see that it’s appropriate to ask for help, or need someone, but when it comes to myself, I am a turtle.. Totally legit fear of fainting, especially when you had the trauma of having it happen, that’s basically a bridemaids worst night-mare! So glad you faced your fear, and reached out for help! This is a beautifully written article, that has expressed something I’ve been dealing with perfectly. It’s hard to be vulnerable and open with others, and sometimes even with God. I would never have described myself as a proud person, but I hate being seen as weak. Thank you for your honest writing, it’s so encouraging. I totally get the gist, I get like that ever so often, if you can do it yourself, don’t ask for help! This how I act most of the time, but then, I don’t always act like this cos I want to, I have a very huge tendency to get overly dependent on people and its very very unhealthy, so I think, better independent than co-dependent and the rest of the words used to describe this situation. Its really hard to draw the thin line(very thin I must add!) between these two and that’s why the Holy Spirit is a gift I cannot(you shouldn’t either) for granted.